The reef in front of the Daniela Diving Centre is really amazing due to the huge number of beautiful untouched corals on the plateau as well as the drop off. Best diving conditions to enter and exit will be found on high tide and calm wind. To enter and exit easily we pass one of the three lagoons snorkelling to the edge of the reef table through one of the natural pools. Descending on the edge we discover a maximum depth of 12 metres, following the plateau in a direction of 120°, we arrive at the drop off starting in a depth of 25 metres. All along the housereef from north to south there are beautiful huge table corals, which are all nearly untouched. 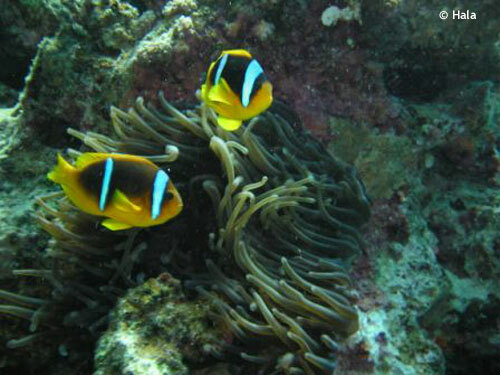 Attractions: Stonefish, Turtle, Crocodile-Fish, Stingray, Barracudas, Surgeonfish, Napoleonfish. Entrance/Exit: Easy on high tide and calm weather conditions.